Little palettes full of jewel-toned, shiny eyeshadows for $27? Or course I'm in! 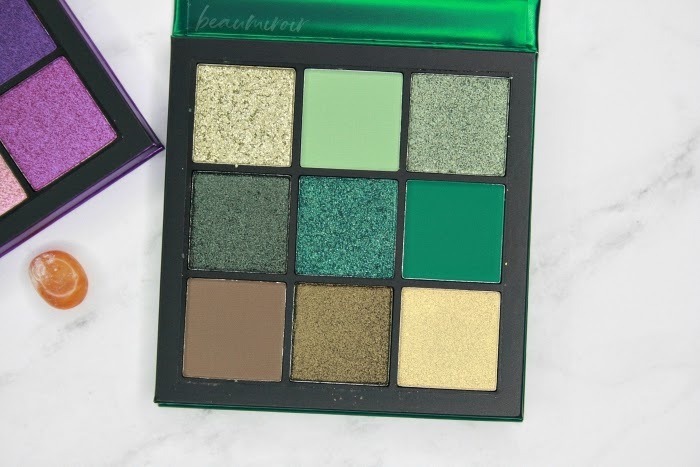 You already know that I love the formula in the Huda Beauty Obsessions Palettes, so I grabbed purple Amethyst and green Emerald as soon as the new, limited edition Precious Stones collection came out. I've been playing with both in the past few days, and I'm ready to share my first impressions. Keep reading to see if they're as good as they look! 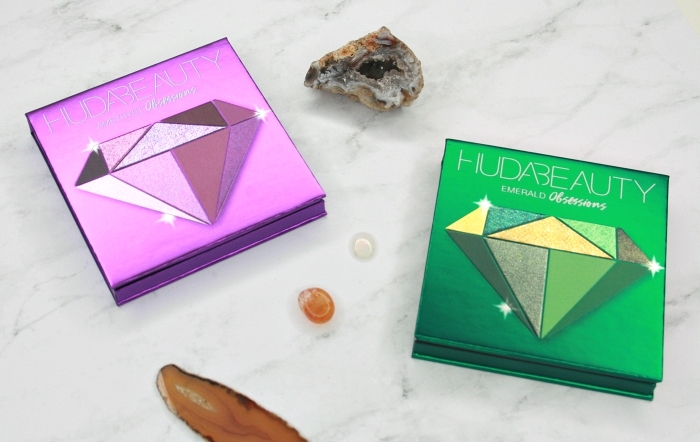 I can't help but think that this new Precious Stones series was inspired by the Gemstone Obsessions Palette that Huda Beauty launched in May. 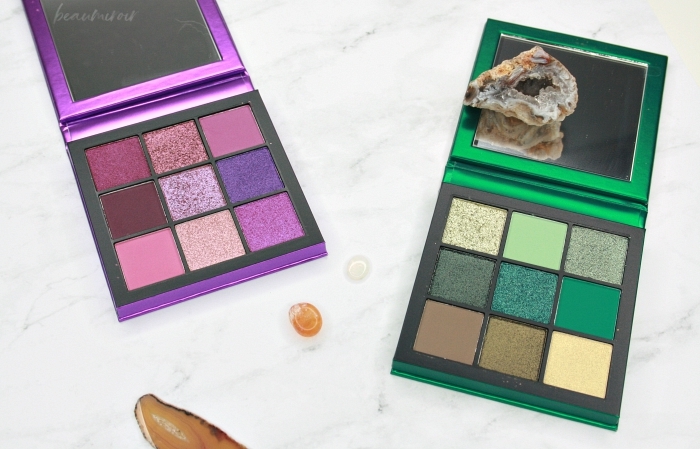 While that original Gemstone contained all shimmery/metallic shades in purple, pink, green and red tones, the Precious Stones Palettes include shadows in a mix of finishes and textures. Besides Amethyst and Emerald, there's a red Ruby, an orange Topaz and a blue Sapphire. Worth noting: although these Obsessions Palettes are often referred to as "minis" and only cost $27, each shade in there weighs 1.1g (vs 0.71g per shade in the Anastasia Beverly Hills Norvina palette, as a comparison). 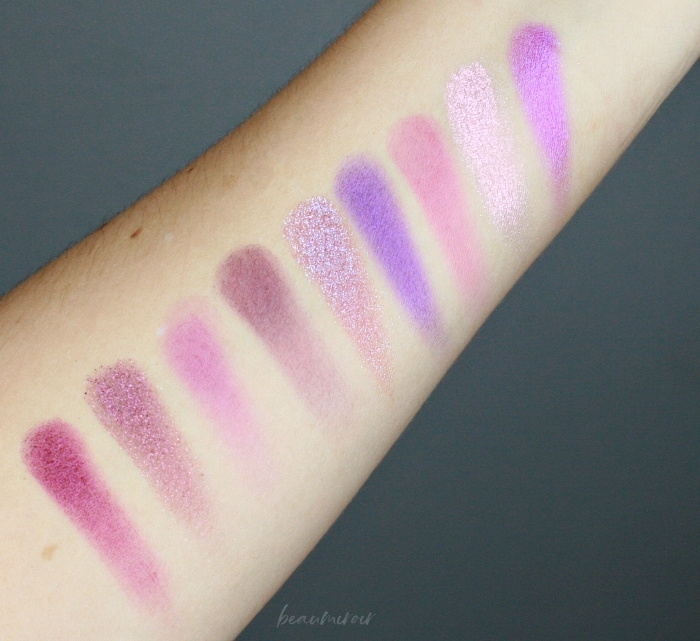 Another thing to keep in mind is that photos and swatches of these shadows never do them justice. They are extremely luminous in person, as they catch the light with their multi-dimensional shimmer, so don't be put off if you think that they look a little dull. Trust me when I say that they look anything but dull in real life! - a very reflective, glittery pale golden green. This shade has the classic texture of Huda's glitter shadows: it looks chunky in the pan, but applies pretty smoothly. It's fairly sheer and best used as a topper to add a pop of sparkles to any other shade, or in the inner corner to attract light. - a matte pale mint. This one doesn't swatch great but I find it easy to build, and it doesn't look chalky on my skin tone. - a cool toned, muted medium silver green with a shimmery finish. It's not as chunky in the pan as the first shade, and not quite as metallic. It's also rather sheer but very shimmery, and I loved how it looked in my inner corner. - a dark forest green with a soft shimmer. It's not quite a satin shade, but it's a lot less sparkly than many Huda shimmer shades. This one has a gorgeous, rich color payoff. - a shiny blue green with lots of reflective shimmer. This is my favorite shade in the Emerald Obsessions palette, I just love the color! - a matte kelly green with a strong blue undertone. I feel like this shade is very close in tone to the previous one, just a little less blue, so they pair together beautifully if you like to play with texture contrast. It also doesn't swatch great but built and blended easily on my eyes. - a matte muted brownish khaki. 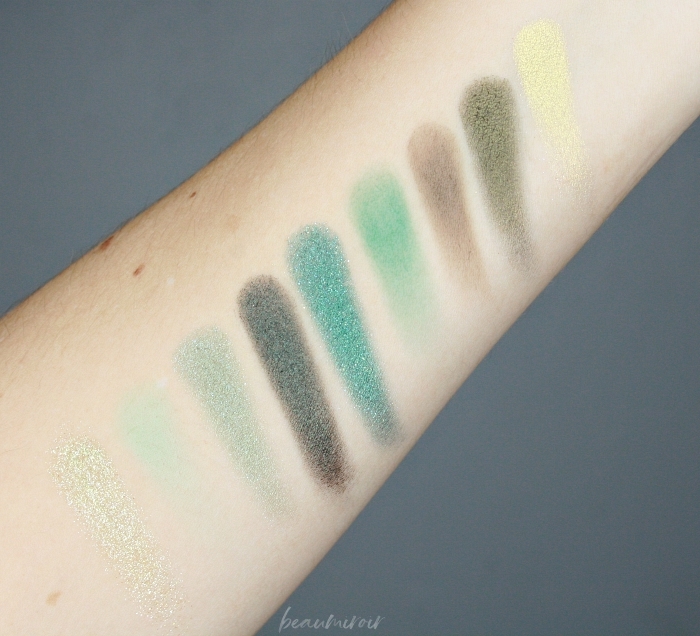 It's the softest of the three mattes in this palette, and it swatches the best. - a richly pigmented golden olive with soft shimmer, the finish being close to satin, similar to the forest green. - a pure yellow gold with a reflective pearl finish, but no visible glitter. It looks beautiful as an inner corner highlight. - I absolutely love the fact that the color selection is unlike any other palette I have seen. - However, the consequence is that I find it a little difficult to use on its own. Without a few neutrals to use in the crease or outer corner, my looks quickly turned more editorial than wearable - for someone like me. I think I might try using a couple shades from this palette at a time as pops of color, paired with neutrals to create the base of the look. - I do really like that you get greens both with very cool or golden shimmers in here. 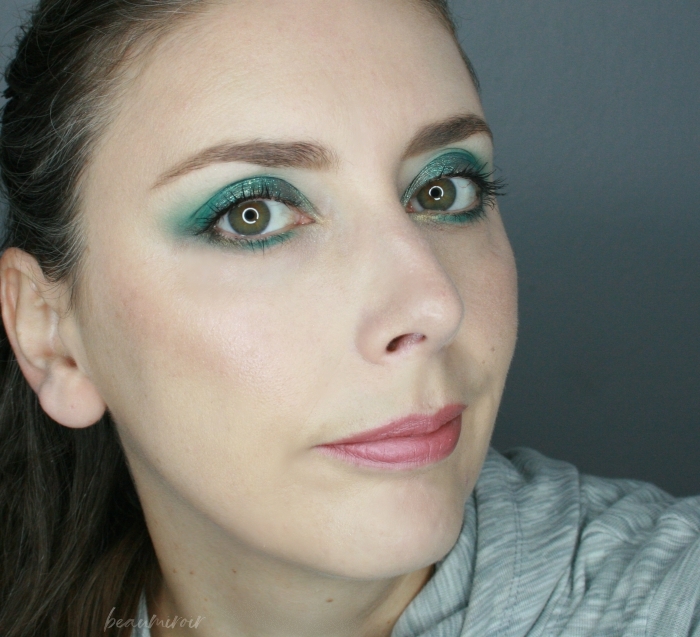 The look I took pictures of was built around the cool blue-green shimmer and kelly green matte, but you can also do a much more neutral look with the khaki, olive and gold for a completely different vibe. - The mattes are a little thin and not super pigmented in one swipe but I found them easy to work with. The shimmers and glitters apply beautifully with a dry brush on my lids. All you have to do is pat and drag your brush just a little bit to build the intensity and shine. The most glittery shade are easy to layer with a fingertip. I had very little fallout with this palette, I could easily do my base first and then my eyes without fear of ruining my foundation with glitter fallout. 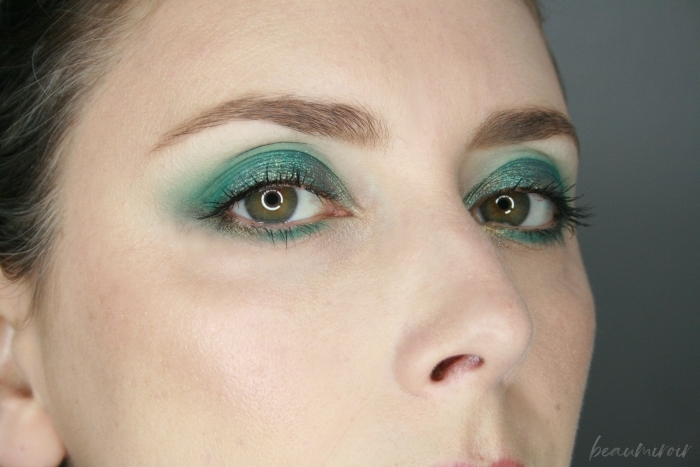 Here are the details of the look below: pale mint in the crease; matte khaki in the outer crease; gold on the tear duct; silver green in the inner corner; blue-green shimmer on the lid, with pale golden green glitter tapped on center; kelly green matte in outer corner and crease, plus lower lash line; forest green shimmer on outer part of lower lash line. - a pink berry shade with a soft satin shimmer. I'm here for the purple so to be honest this is not a shade that appeals to me. - a sparkly berry with a strong rose sheen. Same, not the shade in this palette I'm most excited about, but if you like your very warm tones, these first two shades would probably work great for you. - a mid-tone rosy purple matte. 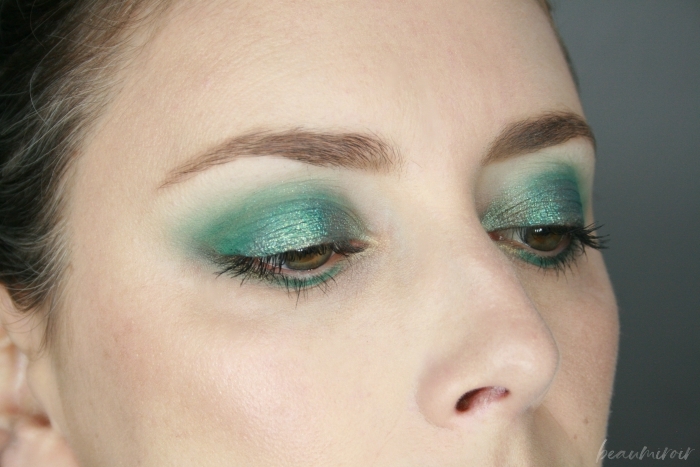 Similarly to most mattes in the Emerald palette, this one swatches a bit dusty and weak, but built easily on the eye. - a dark matte plum. Again, not super impressive in swatches, but easy to use on the lid. - a glittery plum with strong blue shimmer. 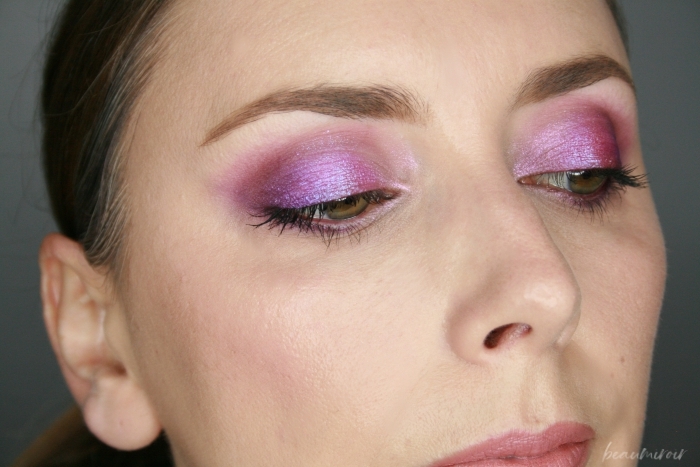 This is a sheer shade that works great as a topper in the center of the lid. - a gorgeous dark purple with a soft satin shimmer (similar in finish to the first shade and the forest and olive greens in the Emerald palette). This is the coolest toned, and my favorite shade in the Amethyst palette. - a medium rosy pink in a matte finish. This one is softer than the other two mattes, and more pigmented in swatches (funny how the shades in the same spots in both palettes tend to have similar finishes). - a very shiny, reflective pink with warm undertones. - a bold dark fuchsia with blue pearl, another beautiful shade. - I'm not a big fan of pinks and I was concerned that the matte shades being very rosy would ruin the purples for me. It wasn't the case at all, I think the mattes do a great job at creating the base of a look with the shimmers being the star of the show. - The color selection is obviously less unique than Emerald, but I found this palette easier to use by itself. Not that the looks I created with it are "day looks" for me, they're still very bold and sparkly. But I just found them a little more wearable and less "in your face" colorful. 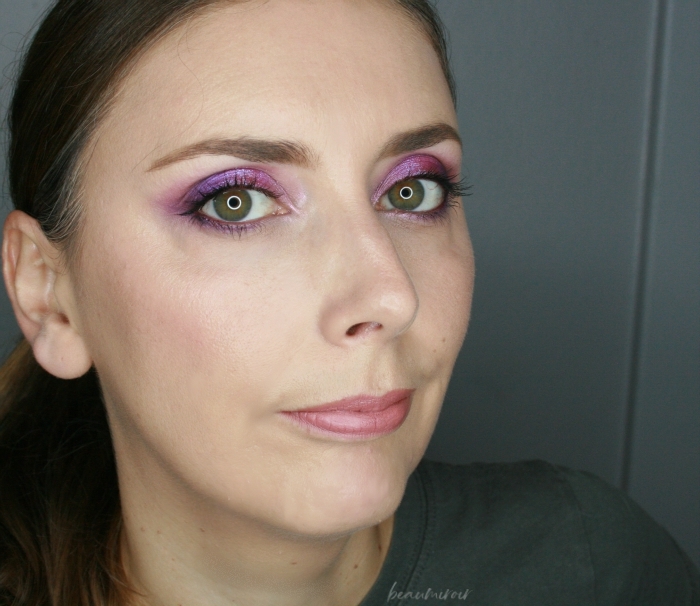 - The purple and plum tones play really well with the green in my eyes. 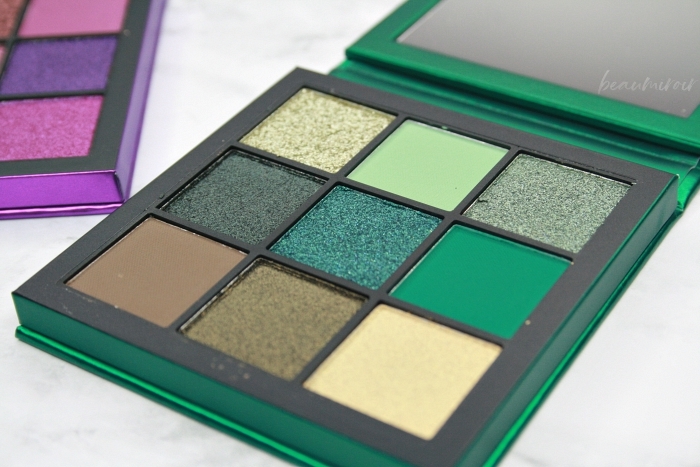 - Just as with Emerald, the mattes and shimmers were very easy to work with and I didn't need to change the way I typically apply eyeshadow to make them perform well. - While Amethyst and Gemstone have similar shades, none of them are complete dupes. The closest are the bottom center shades in both palettes, the shiny, reflective pinks. The one in Amethyst is shinier and pinker. Gemstone also has a shimmery dark purple but it's brighter and more metallic, while the one in Amethyst is more satin. Both palettes also have a glittery plum with blue shimmer, but the base color in the one from Amethyst is a lot warmer and rosier. 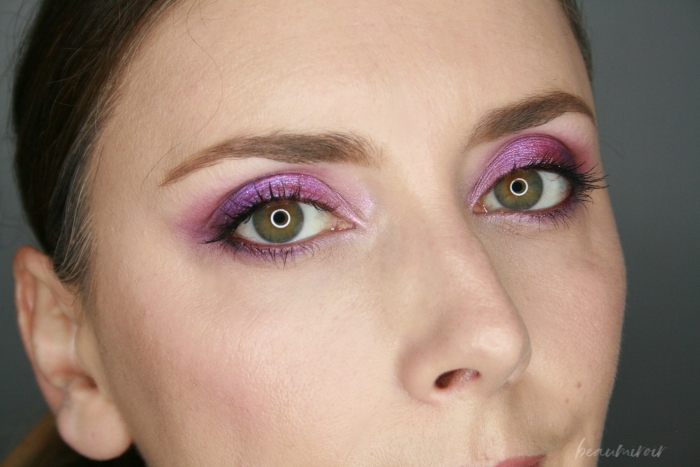 Details of the look below: matte pink in the crease; rosy purple matte in the outer crease; matte plum in the outer V; light reflective pink in the inner corner; fuchsia shimmer on the lid, with glittery plum with blue shimmer tapped on center of lid; shimmery purple in outer corner. 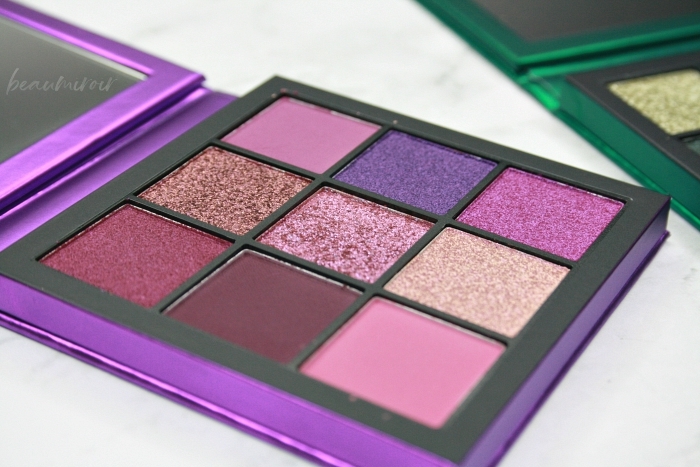 In terms of quality, Amethyst and Emerald are on par with previous Obsessions Palettes releases by Huda Beauty: they have blendable, buildable mattes, rich shimmers, and show-stopping glittery shades that catch the light and turn your eyes into disco balls. 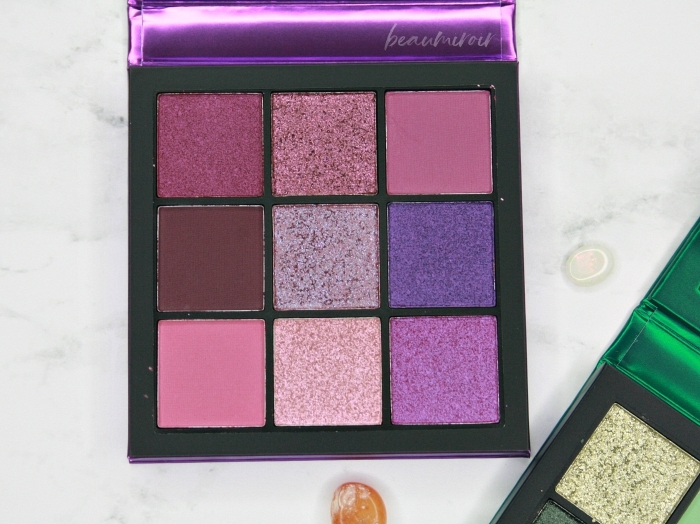 If you are on the market for a small, affordable palette that will allow you to create bold, sparkly evening looks, they're definitely something I would recommend. Amethyst is a more familiar collection of plums and purples, while Emerald is a more unique selection of varied tones of greens. I would say that Emerald is best suited for the true green lovers, or people who are not afraid to experiment with bold and unusual colors. The productS featured in this review were purchased by me. I received no compensation to write this post, which only reflects my personal opinion. This post contains affiliate links. I receive a very small commission when you shop through those links, and the money generated covers a small portion of my expenses to purchase products for review. Clicking on those links helps ensure that Beaumiroir continues to publish reviews of new and exciting high end French products - at no cost to you!